Ezt a terméket eddig 138 alkalommal vásárolták meg! Plagron PK 13-14 is a high content, phosphorus and potassium boost that is used during your plants flowering period to increase the yield from your crop. During this critical stage, your plants requirements will significantly change and their need for higher levels of phosphorus and potassium will greatly increase and adding Plagron PK 13-14 in with your regular Nutrients will supply your plants with more of the elements they need. Plagron PK 13-14 will stimulate and accelerate the growth rate of flowers or fruits that develop on your plants, providing a denser and heavier harvest. Plagron PK 13-14 can be used with any method of cultivation, hydroponics, coco or soil. 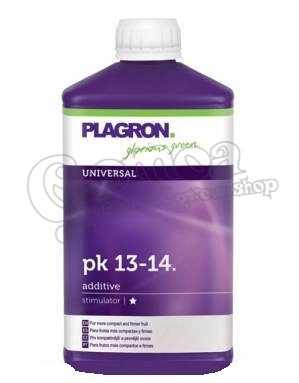 Add Plagron PK 13-14 first to the water, then add your nutrients and check the EC of your solution. Start using from the fourth week of the flowering period at 0.5ml per litre of water. From the fifth week of the flowering period, use at 1ml per litre of water. Use Plagron PK 13-14 right up until one week before harvest.